For the last 35 years I made my living working with sculpture and metal. 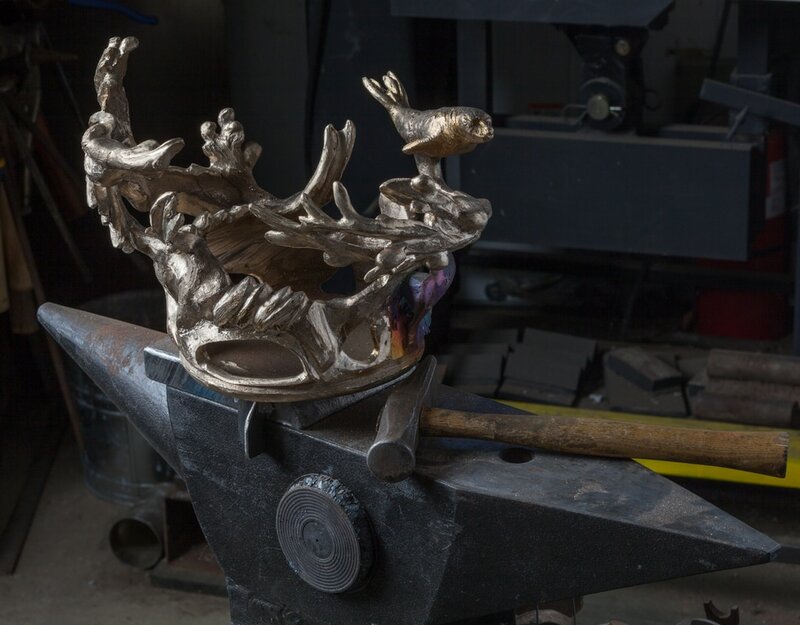 I have operated my own bronze foundry and forge and have done restoration and conservation on major pieces for museums, galleries and art insurance companies throughout the NY metro area. This includes working on Botero, Nevelson, Julio Gonzales, Judd, Castle, King, Flanagan and Jim Dine to name just a few. Using my skills with metal, mold making, casting, rigging and pyrotechnics, I have worked on feature films, broadway shows and TV commercials. As a member of the IA film union and Scenic Artist union I have done special effects, prop making and weapons for feature films including Meet the Parents, Crocodile Dundee, One True Thing, You’ve Got Mail, Thomas Crown Affair, Ironweed, and The Talented Mr Ripley. I have also worked on Broadway shows including Phantom, Les Miserables and Miss Saigon. My movie adventures: include working all night on the city streets making it rain and snow, creating wind and fire, staging shootouts, blowing up Cadillacs on the docks, setting people on fire, launching people off buildings and through windows. I’ve welded stunt cars for crashes, made carbon fiber knives, molded and cast rubber fish, lawnmowers, rubber rifles and other weapons for movies like Crocodile Dundee 2 and Ironweed. I blew up Sony TV’s for David Letterman, worked on commercials souping up prototype vacuum cleaners, faking microwave popcorn and making things bubble and smoke. I also welded a special effects rig on a ledge atop the Empire State Building for a commercial. Working in sculpture and objects restoration: includes rescuing and repairing sculpture damaged by fallen trees, repairing public art hit by a city garbage truck and a drunk driver, restoring art damaged by fire, smoke and floods. I was escorted by armed guards into the ground zero area of 9/11 to evaluate the contaminated arts collections in the vault of the doomed Deutche Bank Building. Degrees: include a BA in Arts and Planetary Sciences from Johns Hopkins, an MFA in Sculpture from Pratt Institute and a Masters in Design from Philadelphia College of Art. I apprenticed as a blacksmith making traditional hardware and forging Damascus knife blades. My study in welding includes the Hobart Technical Institute and I am a certified T.I.G. and structural welder. I worked at the Tallix Sculpture Foundry doing bronze casting, chasing and patinas. 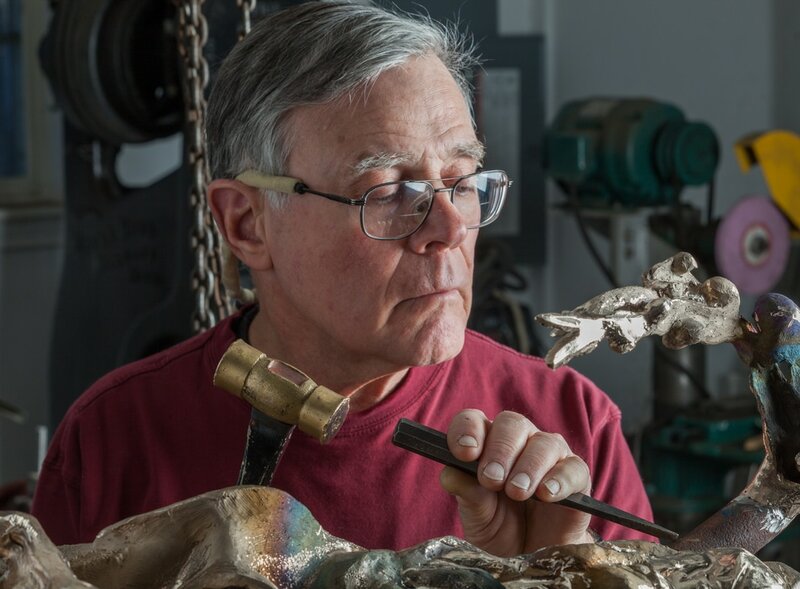 Teaching experience: includes being an instructor at The Sculpture Center in Manhattan, Apex Technical School and the Professional Diving School where I taught under water welding. As a visiting professor I taught welding and sculpture at Pratt Institute, Stockton State College, Indiana University PA and Passaic County College. I’ve taught workshops in welding, blacksmithing and bladesmithing at Wooden Boat School, Peters Valley, Naples Mill, Truro Art Center and Old Church Cultural Center. Public art commissions: include a 9/11 memorial using structural steel recovered from the fallen buildings and a 1% For The Arts on site fabrication to name a few. I’ve had several one man shows in the New York area and exhibited in a variety of galleries in the NY metro area and am looking forward to continuing exhibiting in my new home of Maine.